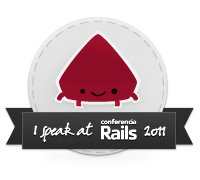 This entry was posted on February 28, 2010 at 10:32 pm	and is filed under conferences, conferenciarails, conferenciarails2009, javier ramirez, ruby, ruby on rails. Tagged: conferenciarails, conferenciarails2009, javier ramirez, rails madrid, ruby madrid, ruby on rails. You can follow any responses to this entry through the RSS 2.0 feed. You can leave a response, or trackback from your own site. Me parto contigo Javi, aparte de eso la charla parece muy interesante, lo veré en casa, que aquí está un poco mal, no ?